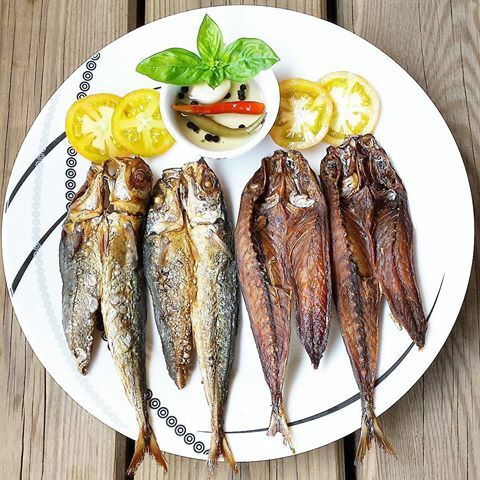 Dried split fish, commonly known as “daing” (split form) is the fish that has been converted from the fresh state to a much lower moisture level with the use of heat with or without salt to maintain its acceptability over an extended period of time. 1. Wash the Galunggong thoroughly with clean and fresh water. 2. Split the fish into butterfly fillet and remove the gills and internal organs. Wash fish again thoroughly. 3. Place the fish in a strainer and drain. 4. Prepare the brine solution (i.e., mixture of water and salt). For a 60-kg. fresh fish, use 6.5 kls. of salt and 5 gallons of water. 5. Soak the fish in brine solution for one hour. 6. Drain the salted fish. 7. Rinse the fish thoroughly under running water to wash off excess salt. 8. Arrange or lay fish in wire screen mesh. Do not place the fish on top of each other so that fish will dry evenly. 9. Cover the fish with the other half of the screen mesh/wire screen to prevent contamination while drying. 10. Dry fish under the sun or direct sunlight for two to three days. 11. After drying, allow the dried fish to cool for at least 6 hours at room temperature. 12. 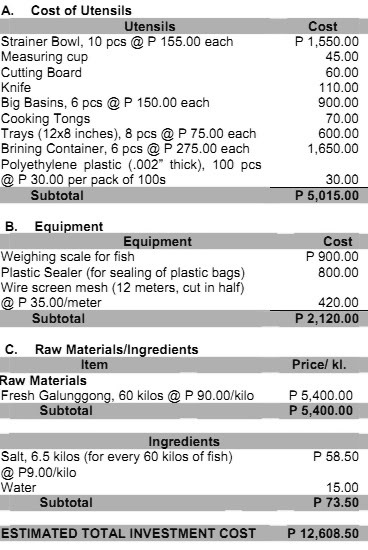 Weigh, pack, seal, and store dried fish at room temperature. – Salted fish drying is done for 22 days / month. – 60-kg. fish produces 40 kg. of dried fish (daing). – An Information Kit (Coastal Ecosystem). Department of Environment and Natural Resources (DENR). * The higher the volume of production per day (more than 60kgs. ), the lower the production cost, thus further increasing the mark-up to more than 25%. The higher the mark-up, the higher the profit margin. * If price per kilogram is lower compared with the existing market price, increase mark-up to 25% or more. BFAD Office in the province where the business is located. TRC Building, 103 J. Abad Santos cor. 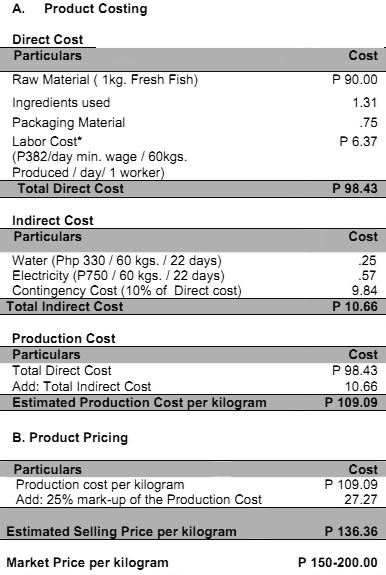 Cost of legal permit on dti?